When a generous little boy offers the local barefoot character a pair of his father’s shoes, the man tries them on, only . . .
but unfortunately his feet were not. there was something special I’d forgot. 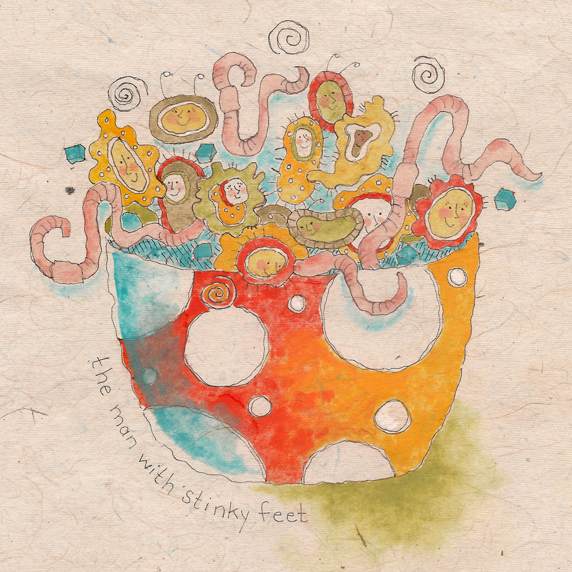 The Man With Stinky Feet is a charming parable about respecting a person’s right to be who they want to be. It offers a gentle twist on the adage ‘walk a mile in another man’s shoes’. he never wore any shoes. often stepping in cattle poos! that squished between his toes. as an attack upon my nose! on his feet they all resided! he was always so cheerful and happy. because his feet smelled like a nappie! as he strolled throughout the town. that sparkled as he pranced around. to give the man some shoes. My daddy had loads, so he wouldn’t mind. Now, which pair should I choose? and his slippers much too hairy. and his sandals were just plain scary! for the man with stinky feet. with buckles like shoes on High Street. that I had carefully selected. and his feet would be protected. I saw the man with stinky feet. as he scampered from street to street. which at first he politely rejected. so he smiled and then accepted. and put his new shoes on. and the worms and germs were gone. and he could only sing the blues. I asked him what was getting him down? He said something was just not right. He said the shoes were a perfect fit. He admired how the buckles shined. and said my generosity was very kind. so the situation was immediately corrected. All the worms and germs were gathered up. They had been searching for a new home. that I borrowed from a garden gnome. and waded and paraded through muck. making sure that most of it stuck. to climb upon my feet. I could see they were all very excited. It really was such a treat. it tickled and made me smile. I laughed and danced all the while. is quite thoughtful and that’s well known. to just take off your own!